In the beginning there was DEATH BEFORE DISHONOUR. So came death and for some also came undeath. Then striding through the gates of hell came THE COACH wielding the mighty contract. Many were tested, many were weighed and many were found wanting. 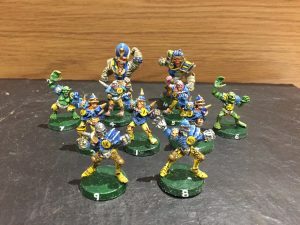 However eleven were chosen and received the sacred blue and yellow of the Koffin Dodgers and into the realm of WOWLOF came HONOUR AFTER DEATH. Koffin Dodger XI vs Waaghrriors! !